A note in Quiver is comprised of cells --- snippets of text, code, Markdown, LaTeX (via MathJax) or diagrams (sequence diagram, flowchart). You can freely mix different cell types within one note. You can set different languages for different code cells, too. The programmer's notebook should make code editing effortless. 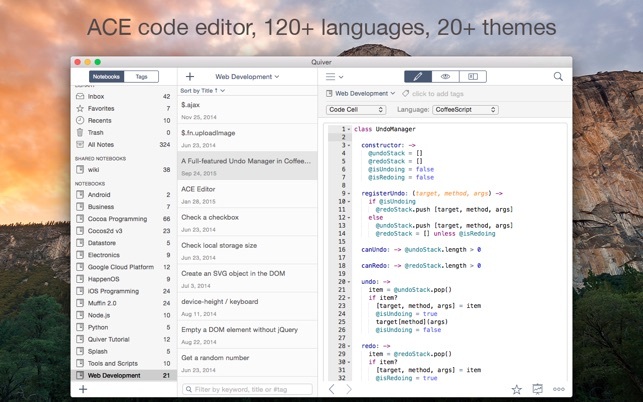 Quiver packs the awesome ACE code editor in code cells, with syntax highlighting support for more than 120 languages, over 20 themes, automatic indent and outdent, and much more. Quiver lets you write in Markdown with inline formatting and custom CSS options. A live preview window renders Markdown as you type. Quiver uses MathJax to typeset mathematical equations written in LaTeX. Please note that MathJax doesn't provide a full LaTeX environment. Only math-mode macros are supported. 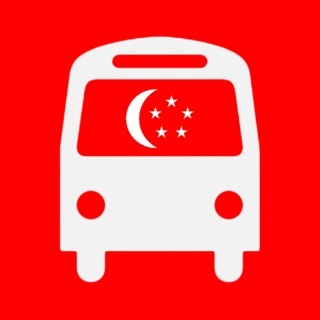 Drag an image into a text cell and it will be saved locally with the note. Drag a file into a text cell and it will become a clickable file link. URLs in text cells are automatically detected. Notes are only useful if you can find them quickly. 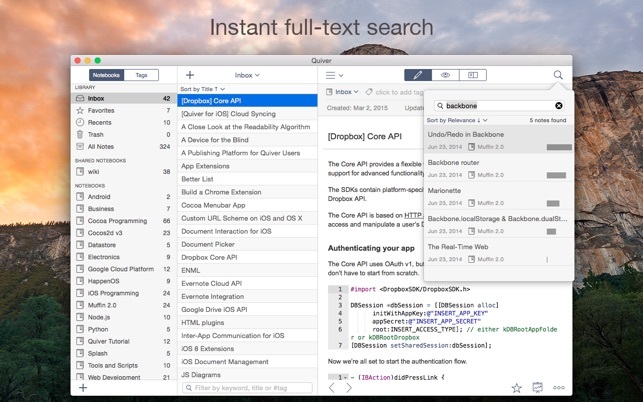 Quiver's full-text search is based on Search Kit, the same technology used to power Spotlight on your mac. That's how Quiver can search through thousands of notes in a blink of an eye. 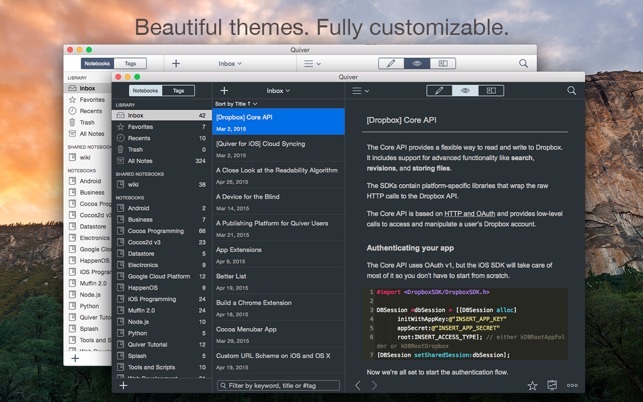 Quiver comes with several beautifully designed UI themes, and they are fully customizable. 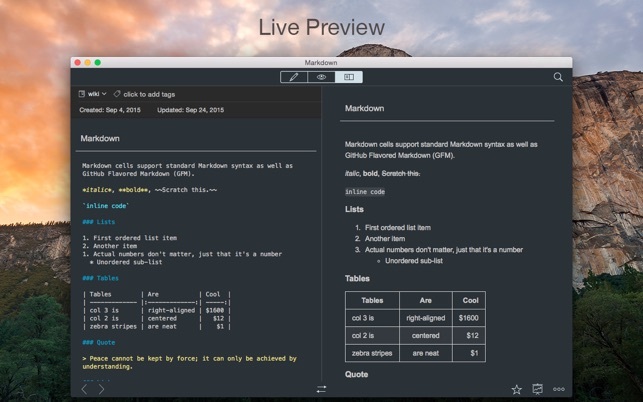 Quiver supports live preview of Markdown and LaTeX cells. 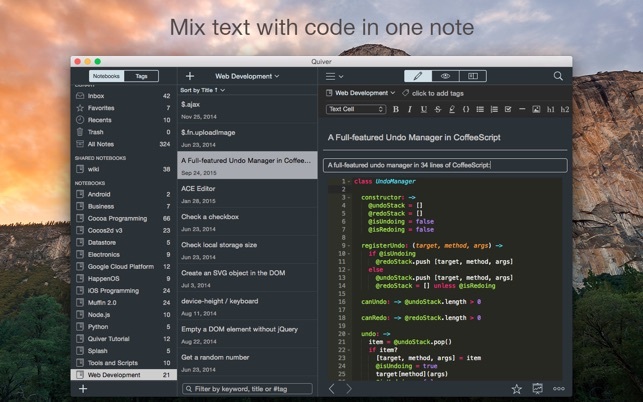 Quiver provides a full-screen presentation mode for your notes. This is great for classroom use, team meetings, presentations, as well as reviewing notes on your own. Quiver has tagging support. You can assign multiple tags to a note or assign a tag to multiple notes at once. Combined with notebooks and linked notes, you have many different ways to organize your notes. Quiver automatically saves all your changes as you work, so you never need to worry about losing changes. Quiver saves all your data in plain JSON files. These data files reside on your local machine. You can easily export your notes in different format such as HTML and PDF. Quiver lets you sync all your notes across multiple computers via Dropbox, iCloud Drive, Google Drive, or any other file-based cloud services. It’s easy to collaborate in Quiver. You can create a shared notebook so everyone on your team can view or edit notes in the notebook. This is a great way to build a shared knowledge base for the team. Since Quiver stores all the data in plain JSON files, it’s easy to put the whole library (or a specific notebook) under version control. This is another way to collaborate with your team. Quiver lets you back up your entire library with a single click. Restoring your library from a backup is just as easy. Quiver doesn’t lock you in. It stores data in a well-documented plain JSON format. So it’s easy to write scripts to integrate Quiver notes with other tools you use. Common scripts are provided on the Quiver documentation site. Quiver comes with in-app tutorials and a comprehensive online wiki. Anyone can contribute to the wiki and make it better. * Added web clipper support. “Quiver Web Clipper” is available for download from the Chrome Web Store. * Fixed a bug that caused loss of note edits when a note was opened in a separate window and subsequently moved to a different notebook. Für meinen zweck ein perfektes tool, kann alles was txt ist aufnehmen, übersichtlich darstellen und wieder finden. Die ios version ist nur ein viewer, aber mal ehrlich wer schreibt schon am Handy? Ich würde mir eine Kalenderansicht wünschen, dann könnte ich ein schönes Diary daraus machen! Sonst bitte weiter entwickeln! Daumen hoch! Nachdem der Entwickler nun die fehlenden Sync und Backupfunktionen wieder hinzugefügt hat, kann man das Programm wieder uneingeschränkt empfehlen. Der Text/Markdown/Code Editor ist gut. Eine Suchfunktion und die Möglichkeit zur Vergabe von Tags sind vorhanden. Wie viele andere Markdown Editoren hat er eine Edit und eine Preview Sicht. Wahlweise auch beides. Die hierachische Struktur ist leider nur eine Ebene Tief bei OneNote zum Beispiel sind es immerhin 2 plus 3. Leider hat der Editor keinen Webdav Client an Board. Für den Bereich 'Private Cloud' oder für kleine Teams hätte ihn das sehr interessant gemacht. Ein externes Sync Tool ist somit notwendig. Die iOS Version hat zwar einen Webdav Client integriert jedoch ohne Sync Funkion und er ist kaum mehr als ein Viewer und kein Editor. Sie Suchfunktion arbeitet über alle Notebooks, eine Einschränkung ist nicht möglich. Fazit: Im Team bleiben wir bei OneNote mit Plugins für SourceCode. Privat könnte er interessant werden, aber auch da muss ich dann mit einem externen Tool synchronisieren. Vielleicht wir er im laufe der Zeit ja noch besser.